Bellagio is a resort offering guests things that are good for the soul -- fine dining, gardens, flowers, art and fashion. With its Tuscan architecture along an 8-acre lake, guests are greeted with the world famous Fountains of Bellagio that express the romantic spirit of the resort. More than a thousand fountains dance in front of the hotel, enhanced by music and light. Guests enter the resort's opulent lobby featuring a ceiling with a sculpture of hand-blown multicolored glass created by the renowned artist Dale Chihuly. Nearby, a botanical conservatory is home to exotic plants and flowers. 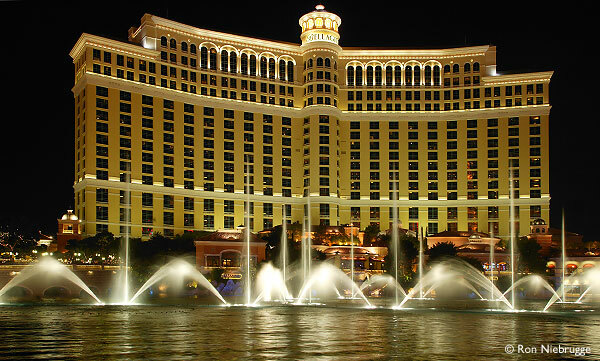 Other features of Bellagio include the gourmet dining establishments such as New York's Le Cirque, Aqua and Picasso. Via Bellagio, an elegant shopping promenade, features boutiques and a host of famous designers. The internationally acclaimed performance troupe, "Cirque du Soleil," is showcased on and above water in the production show, "O." Bellagio meets every need and fulfills every desire. The art is inspiring. The accommodations are unrivaled. And the staff is expert. Expect nothing less than perfect during your stay. For rate and availability information please contact us at 888-987-6667 or via fax 702-693-8546. Rate and availability information cannot be given via e-mail. Bellagio takes reservations 10 months in advance.